Having spent many years developing web products for higher education, I’m always interested when universities or colleges open up their knowledge banks to the public using new technologies (see OpenCourseWare Finder). I can’t wait to try out Stanford on iTunes, a collaboration with Apple to provide public access to a variety of digital audio (will video come soon?) 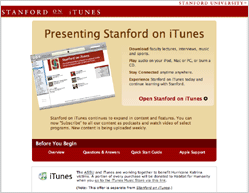 from Stanford, including “faculty lectures, learning materials, music, sports, and more.” Currently, there are supposed by nearly 500 tracks for download via iTunes, with new content uploaded weekly. The project aims to serve multiple sides: current students will have private access to course-based materials and advising content, while the public – alumni, other students, researchers, and the world as a whole – will have access to what was once privileged and costly content. While iTunes is nice (its been my default media player for a year or so, supplanting winamp) it has been rendered obsolete by amaroK, a linux-based media manager that makes extensive use of last.fm and musicbrainz to tag, suggest songs from your library, and even auto-populate your playlists. There’s even a bootable live CD (free music included) for the linux-impaired. Interesting. I’ll have to check that out.